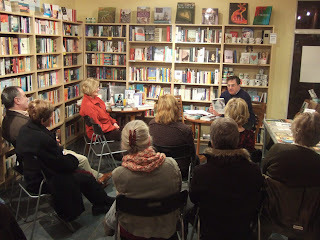 Last Wednesday night we welcomed Andrew Rosenheim to mostly books. As well as giving a very entertaining speech, he read from his novels Stillriver and (his latest) Keeping Secrets. Andrew gave a great talk - and spoke about everything from his experience in publishing (non-fiction - so no help to his current fiction writing career), to how he can't help eavesdropping on his own family for writing inspiration (hope mentioning that doesn't get you into trouble Andrew!). (If you notice the flashing lights outside, the local Electricity company decided to start digging up the road about 5 minutes before we started - which lasted until about 15 minutes after the event ended. Everyone was terrifically British about it and totally ignored it, however).